Illustration: USDA-NRCS PLANTS Database / USDA NRCS. Wetland flora: Field office illustrated guide to plant species. USDA Natural Resources Conservation Service. St. John’s wort can be found in wooded areas. 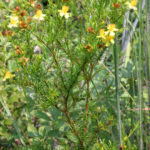 St. John’s wort is toxic and should not be cultivated. Submerged portions of all aquatic plants provide habitats for many micro and macro invertebrates. These invertebrates in turn are used as food by fish and other wildlife species (e.g. amphibians, reptiles, ducks, etc.). After aquatic plants die, their decomposition by bacteria and fungi provides food (called “detritus”) for many aquatic invertebrates.